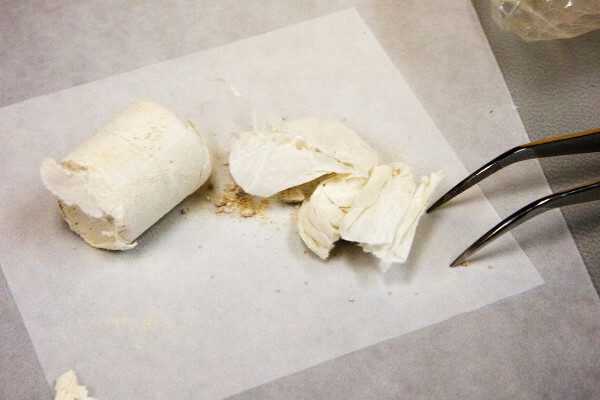 A "finger" of heroin is carefully unwrapped from its paper backing at the state drug testing lab in Augusta. HALLOWELL, Maine — To fight Maine’s opiate crisis, the state should expand health care access and drug courts, better connect people to services and increase prosecution of out-of-state drug dealers, according to a report released Friday by a stakeholder group. The Maine Opiate Collaborative’s report aims to establish a comprehensive plan to fight opiates in the state, which saw a record 272 deaths from drug overdoses in 2015, driven by increases related to heroin and fentanyl. The collaborative originated at an August summit convened by Gov. Paul LePage, and its recommendations came after forums in 20 Maine communities attended by more than 1,500 people. Its findings were issued at a Friday event at the Maple Hill Farm Inn in Hallowell. But they won’t be unanimous, particularly the report’s calls for expansion of health care to people with substance abuse disorders under the federal Affordable Care Act and increased access to an overdose antidote, both of which have been opposed by the Republican governor. The collaborative was led by U.S. Attorney Thomas Delahanty, Maine Attorney General Janet Mills and John Morris, LePage’s public safety commissioner. It focused on prevention, treatment and law enforcement. The Legislature took steps to address opiates in 2016, including enacting a LePage bill limiting opiate prescriptions with some exceptions and requiring doctors to check a monitoring program before prescribing opiates, expanding access to naloxone, which reverses potentially fatal overdoses, and putting $3.7 million toward hiring more drug agents and other services. Other efforts fell short. The Legislature failed to pass a bill to expand Medicaid to an estimated 60,000 Mainers, similar to proposals that have been vetoed by LePage, citing potential future costs. Gordon Smith, executive vice president of the Maine Medical Association, said Medicaid expansion would provide services to 12,000 people with substance abuse disorders, calling it “the single most significant thing people could do right now” to fight addiction. — The creation of a state-level position coordinating state and local responses to opiate use. — Funding new employees in Maine’s eight public health districts to work on education, prevention and intervention services in schools and communities. — Expanding Maine’s medication-assisted therapy infrastructure, reducing wait times for methadone treatment, which was 70 days in central Maine in 2016’s first quarter. — Studying the expansion of Maine’s drug treatment courts, which are in Washington, York, Androscoggin, Hancock and Cumberland counties. — Increasing prosecutions of out-of-state drug dealers by 100 percent in 2017, in part by better intelligence sharing between state and local police.